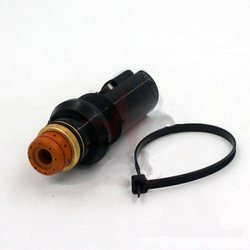 Offering you a complete choice of products which include thermal dynamics nozzle, thermal dynamics shield cap, hypertherm retaining cap, hypertherm swirl ring, hypertherm nozzle and hypertherm electrode. We are authorised distributor of Thermal Dynamics Plasma cutting machine and consumables. 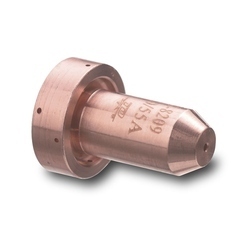 The above image is used as a spare part in Thermal Dynamics Plasma torch. 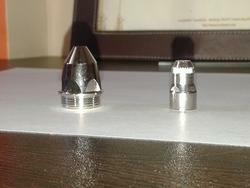 It is called Nozzle as well as Tip and we can supply it . The image above is known as Shield Cap. We are the authorised distributor for Thermal Dynamics Plasma Consumables and machines. 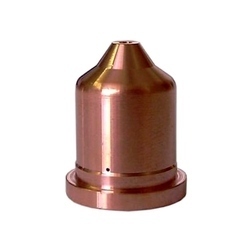 Shield Cap is used as a spare part in Thermal Dynamics Plasma Torch. Sai Weld India provides these plasma consumables all over India. We are suppliers for Hypertherm Plasma consumables. This called as retaining cap. Retaining cap is a spare part of Hypertherm torch. We are suppliers for Hypertherm Plasma Consumables. The image given above is known as Swirl ring. Swirl ring is a spare part of Hypertherm Torch. We are suppliers for Hypertherm Plasma Consumables. This part called as Nozzle. 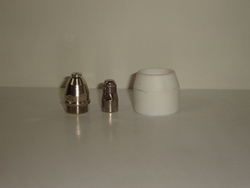 Nozzle is a spare part of Hypertherm Plasma Torch. We are suppliers for Hypertherm consumables and machines. The above image is known as Electrode. 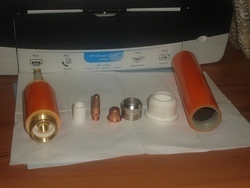 Electrode is a spare pare of Hypertherm Plasma torch. We are the suppliers for P160 Plasma consumables. The standard packing of the plasma consumables is 10pcs. The maximum cutting thickness of P80 Plasma cutting torch is 80mm. The price is very much competitive. We are the suppliers for Cut 60 Plasma consumables. The maximum cutting thickness of this torch is 20mm. The standard packing of these plasma consumables is 10pcs. These plasma consumables have long life as they are good in quality. We provide you the plasma comsumables in competitive price. We are the suppliers for Trafimet A101 Plasma Consumables. The maximum cutting thickness is 35mm. The standard packing of these plasma consumables is 10pcs. The consumables are of best quality and durable to use. We provide it for competitive price. We are the suppliers for Tianzhong Plasma Consumables. The standard packing is 10pcs. The material always available in stock. The maximum cutting thickness of the plasma torch is 30mm. The consumables have a long life and are very much durable. We are authorized distributor for Thermal Dynamics Plasma consumables and machines. The above image is a Electrode. 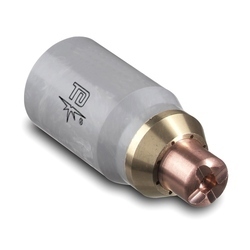 Electrode is a spare part for Thermal dynamics Plasma torch. We are authorised distributor for Thermal Dynamics Plasma Cutting machines and consumables. This image is known as torch head body. This is a spare part of Thermal Dynamics Plasma torch. 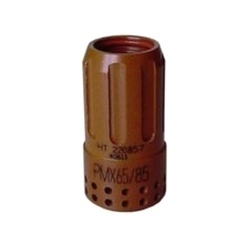 We provide P80 Plasma Cutting Consumables for very competitive price. The maximum cutting thickness of P80 Plasma cutting torch is 35mm. The standard packing for these plasma consumables is 10pcs. 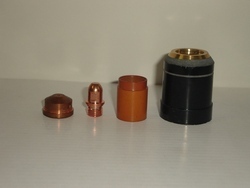 P80 plasma consumables are always available in stock. We are the suppliers for Fanyang 100 and 200 Plasma consumables. The standard packing for these Plasma consumables is 10pcs. The Fanyang 100 plasma consumables are available in stock. We provide these plasma consumables for competitive price. We are authorised distributor for Thermal Dynamics Plasma Consumables. The image above is known as Shield Cup. 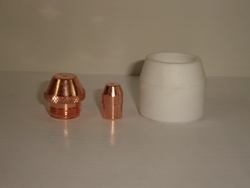 Shield Cup is a spare part of Thermal Dynamics Plasma torch. We supply PT 31 Plasma consumables. The maximum cutting thickness for these plasma cutting torches is 12mm. The standard packing og these consumables is of 10pcs.